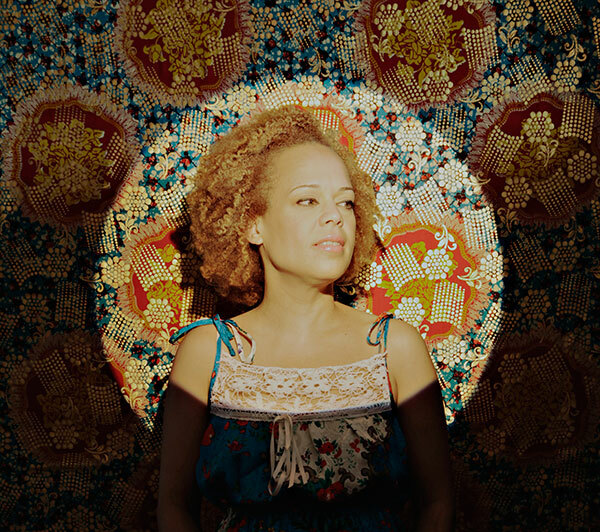 Vocalist, multi-instrumental electronic musician, composer and multimedia artist Christina Wheeler’s musical explorations have included forays in techno, house, 2-step, drum and bass, breakbeat, soul, dance hall, dub, ambient, free jazz and improvisational forms. In her live solo electronic performances, she blends an organic, fluid amalgam of improvised electronic music from a variety of sound sources, which include: processed vocals and vocal loops, hand-triggered sampler playing, processed four-octave electric mbira, processed electric autoharp, processed Q-Chord and theremin, sofware instruments, and live effects processing. Previous band projects include Wiremouth, Floating People, and BlowOut, and current and recent projects include solo song-cycle series, solo instrumental improvisational compositions, The Magical Garden, an ensemble-based multi-media performance/ generative installation project, and collaborations with Laraaji, Vernon Reid, Hprizm/Priest, Greg Tate, and Satch Hoyt. Tres Es un Número Mágico: Kaleidoscopic Triptychs is a three-part, solo composition in audience- generated, chance order and direction, for voice, electric mbira, electric autoharp, Q-Chord, delay loops, and electronic effects processing present in circulation multi-speaker array format. This piece premiered at Sammlung Hoffmann, Berlin, Germany, and was presented in an earlier iterations at Free Rotation Festival, Wales, and later, at Experimental Intermedia, New York. The studio recording of this work is complete and will be released in 2018. Surrender to the Totality of Blackness is a four-part tone-poem suite for a recumbent audience listening in color-spectrally controlled virtual darkness through a multi-speaker array sound system. The piece was created to engender a space that reframes our experience of Blackness and the attendant fear often intrinsically enmeshed in that experience. Instrumentation is: voice, electric mbira, electric autoharp, Q-Chord, iOS apps, sampler, delay loops, and electronic effects processing. Earlier versions of this composition were presented at Free Rotation Festival, Wales, and for the Now now Music Series, in Sydney, Australia. A studio recording of the work is in development. Songs of S + D is a 12-part song-cycle series that presents small vignettes that mine the dichotomy and intrinsic connection between the two great mysteries of life. The work has been presented at Free Rotation Festival (Wales), the 2017 Ableton LOOP Technology Summit, and in concert opening for Shabazz Palaces. Recording instrumentation: voice, electric mbira, electric autoharp, Q-Chord, sampler, delay loops, and electronic effects processing, bass, drums, keyboards, cello. Studio recording is currently in post-production. That Was Then, This Is Now is the prequel to Songs of S + D. The five-song EP addresses themes that are explored further in the following album. Recording instrumentation: voice, electric mbira, electric autoharp, Q-Chord, sampler, delay loops, and electronic effects processing. The studio recording will be released prior to the release of Songs of S + D.
The Magical Garden is a five-part, multi-media performance and generative installation project utilizing audio, video, and LED lighting installation in a multi-episodic, fantasy-narrative, organic setting to be enjoyed by audiences of all ages, backgrounds, and cultures. A concert version of Part I premiered at Issue Project Room, New York. The technology development was supported through a generous artist residency at Harvestworks Digital Media Arts Center, New York. From the Quarter to the (W)Hole: What Lies at the Center of Infinity in the Oceans of the Universe? : A multimedia performance project for voice, glass armonica, string quartets, electronics, and video.